The work of the Adrian Dominican Sisters in advocating justice, peace, and care of creation is rooted in the Word of God proclaimed by prophets such as Isaiah and Amos; the teachings of Jesus in the Gospels; the Catholic Church’s century-old tradition of Catholic Social Teaching; and our own Mission and Vision. For decades, Adrian Dominican Sisters have been engaged, individually and communally, in efforts to protect the integrity of creation and bring about a more just, peaceful and compassionate world. We work in partnership with our Associates, Co-workers, and many friends and collaborators through issue advocacy, alternative investing, corporate responsibility work, and our many different ministries. Climate Change/Ecology: We acknowledge the reality of climate change and the urgency of addressing this issue for the sake of the whole Earth community. Death Penalty: We reverence the life and dignity of every human person and oppose the death penalty, urging support and compassion for the victims of violence and restorative justice for the offenders. Human Trafficking: We oppose the trafficking of children, women, and men for sexual exploitation or any other purpose and call for policies that prevent human trafficking, restore victims to freedom, and hold perpetrators responsible. Immigration: As a Congregation based in a country of immigrants, we call for just immigration reform that treats all people with dignity and respect, keeps families intact, and provides a direct pathway to citizenship. Iraq: The Adrian Dominican Sisters staunchly opposed the U.S. invasion of Iraq in 2003 and called for a withdrawal of U.S. troops. Today, Iraq is afflicted with violence, sectarian strife, and the takeover by extremists of northern territories, leaving tens of thousands of Christians and other minorities displaced. We call on President Trump and Congress to pressure the governments of Iraq and Kurdistan to provide security and infrastructure for Internally Displaced persons – and to expedite resettlement and increase quotas for Iraqis awaiting immigration to the United States. Nuclear Disarmament: The Bulletin of Atomic Scientists recently puts the world at 3 minutes to midnight on their “doomsday clock,” highlighting the dangers we still face of nuclear Armageddon. We call upon the U.S. government to lead the way for global abolition of nuclear weapons and all weapons of mass destruction. To read more about our key issues and initiatives and learn about resources for each, click on the links below. 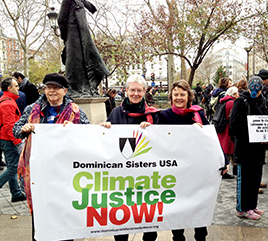 The Dominican Sisters of Adrian stand for climate and ecological justice and are committed to work for the common good of the whole Earth community. We stand at a critical moment in Earth’s history, when we must take steps to halt or lessen the impact of global climate change on our world. In fidelity to our call to reverence life, we recognize our place within the balance and harmony of Earth’s magnificent diversity of cultures and life forms. Along with our commitment, as individuals and as a Congregation, to “live simply and sustainably for the sake of the whole Earth community,” we have been engaged in the issue in a number of ways. Through the Center for Earth Jurisprudence, founded by Sister Patricia Siemen, OP, we educate the public on the inherent right of all of creation to thrive—not just to serve as a material resource for human beings—and work for a legal system that acknowledges the rights of all of creation. Voices for Earth Justice, directed by Associate Patricia Gillis, is an “interfaith network of people committed to prayer, education and action that deepen our sense of wonder, responsibility, and gratitude for all creation.” Our campus Permaculture site models ways of living more lightly and sustainably on Earth. The Earth Charter—an international document that recognizes Earth as our home and calls on all citizens to take the necessary responsibility to respect and care for our planet. Care for all Creation—a six-session process for faith communities, created by the Intercommunity Peace and Justice Center (IPJC). The Catholic Climate Covenant calls on the faithful to care for the Earth, noting that the impact of climate change—brought about in large measure by the Western, industrialized world—has the greatest impact on people who are poor. Encyclical letter of Pope Francis on care for our common home. 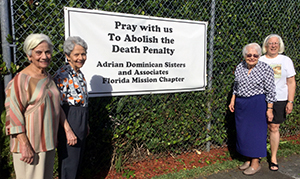 In their commitment to the life and dignity of every human person, the Adrian Dominican Sisters stand in solidarity against the death penalty. We share in the pain and suffering of the victims of violence, and their families, and support them in prayer, compassion, and the struggle for healing and justice. At the same time, we call on the citizens of the United States to forgiveness and compassion for the offender, leaving the final judgment to God and leaving open the possibility of reform and redemption for the offender. The Catholic Church’s social doctrine recognizes that the state may impose the death penalty upon criminals convicted of heinous crimes, but only if this is the only available means to protect society from a grave threat to human life. This condition is almost non-existent today. Although our home state of Michigan abolished the death penalty in 1846, the Adrian Dominicans are mindful of inmates who are executed. On the day of an execution, a bell tolls at 3:00 p.m. to remind the Sisters, Associates, and Co-workers to pray for the person scheduled to be put to death. The Culture of Life and the Penalty of Death—a statement by the U.S. Conference of Catholic Bishops (USCCB) to put an end to the use of the death penalty in our nation. Facts about the Death Penalty—updated facts about the death penalty, posted by the Death Penalty Information Center, in such areas as the numbers of people executed, the disproportionate percentage of African Americans and other minorities who are executed, the tremendous cost of the death penalty, and its failure to deter crime. For Whom the Bells Toll—A program coordinated by People of Faith Against the Death Penalty to encourage congregations to ring their bells for two minutes on the day of an execution in the United States. The Intercommunity Peace and Justice Center (IPJC), whose Program Director is Sister Judy Byron, OP, organizes a silent vigil to raise awareness of human trafficking on the first Sunday of every month. Sisters in Adrian started a human trafficking task force in 2009 that has now become a larger Lenawee County community effort, joined by members of the local chapter of Zonta International, as well as local law enforcement professionals, professors, medical personnel, social workers, students, and concerned citizens. In Illinois, Project IRENE (Illinois Religious Engaged in Nonviolent Endeavors) provides an avenue for women religious of the state to be involved in legislative advocacy for justice. Since 2010, Project IRENE has successfully advocated for one bill each year to enable the state to prosecute human traffickers and protect and uphold the rights of the victims. 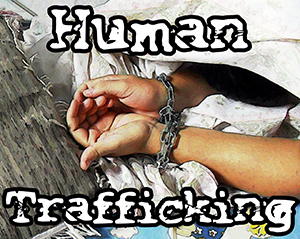 Stop Trafficking!—monthly newsletter on human trafficking, which we are proud to sponsor. The Adrian Dominican Sisters “call on Congress to pass comprehensive immigration reform that includes reunification of families, and a path to citizenship for law-abiding immigrants living in the United States. Until such time as this is achieved we support a moratorium on deportations. Sister Attracta Kelly, OP, former Prioress of the Congregation and an immigration attorney, has trained Sisters and volunteers from the Adrian community to work with young, undocumented immigrants who had been brought to the U.S. as children. The goal was to help the young people successfully apply for temporary relief from possible deportation through the “Deferred Action for Childhood Arrivals” program begun by the federal government. Immigration: An Initiative for our Times—a 52-page booklet, produced by the Adrian Dominican Justice Promoters, designed to walk people through a theological reflection on the issue of immigration in our times. Strangers No Longer—joint pastoral letter on immigration issues in the U.S. and Mexico by the United States Conference of Catholic Bishops (USCCB) and the Mexican Episcopal Conference. In November 2005, the Adrian Dominican Sisters issued a corporate stance firmly opposing the U.S. war in Iraq. Today, while the official war has ended, the people of Iraq still suffer from continued sectarian violence and the invasion of northern territories by ISIS insurgents. In August 2014, tens of thousands of Iraqis, primarily Christians and other minorities, fled their homes on the heels of an attack by ISIS forces. They are living in the Kurdish region as refugees in their own country—or internally displaced persons—having left lives and livelihoods behind. Adrian Dominicans stand in solidarity with the Dominican Sisters of St. Catherine of Siena of Iraq and the people of Iraq. In January 2015, a delegation of Dominican Sisters—Marcelline Koch (Springfield), Arlene Flaherty (Blauvelt) and Durstyne Farnan (Adrian)—visited the Sisters and toured the displacement camps to witness the conditions first hand, and help spread the word. We call on President Trump and Congress to pressure the governments of Iraq and Kurdistan to provide security and infrastructure for Internally Displaced persons—and to expedite resettlement and increase quotas for Iraqis awaiting immigration to the United States. 1000 Cranes for Iraq—A group of Dominican artists are creating artwork to support the ministerial efforts of the Adrian Dominican Sisters on behalf of the exiled and displaced people of Iraq. Each in her own way is recreating the spirit of origami peace cranes and donating the work as a benefit. The net proceeds of their work will be used by the Dominican Sisters of St. Catherine of Siena for their relief efforts in Iraq (see website for details). Catholic Relief Services (CRS) “carries out the commitment of the bishops of the United States to assist the poor and vulnerable overseas.” The organization “promotes human development” throughout the world and helps U.S. Catholics to “live out their faith in solidarity with their brothers and sisters around the world.” See how CRS is helping the people of Iraq. I Have Family in Iraq—Facebook page with photos and stories of the delegation’s visit with the sisters and other displaced Iraqi Christians and minorities. The Adrian Dominican Corporate Stance, adopted in 2007, calls on the U.S. government to lead the way for the global abolition of nuclear and all weapons of mass destruction by adopting a plan to lock down, reduce, and eliminate nuclear and all weapons of mass destruction. We call for immediate development, adoption and implementation of a plan that will ensure that there will be no new nuclear weapons, no new materials for nuclear weapons, and no testing of nuclear weapons. Although many people have lost their concern about the possibility of nuclear war, the Bulletin of the Atomic Scientists recently moved the hand of their “doomsday clock” to three minutes to midnight from five midnights to midnight—for the first time in three years. "Unchecked climate change, global nuclear weapons modernizations, and outsized nuclear weapons arsenals pose extraordinary and undeniable threats to the continued existence of humanity, and world leaders have failed to act with the speed or on the scale required to protect citizens from potential catastrophe,” the organization noted in a statement. 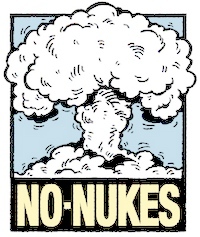 International Campaign to Abolish Nuclear Wars (ICAN)—a “global campaign coalition” advocating for a treaty banning nuclear weapons. United States Conference of Catholic Bishops (USCCB)—statements and resources on nuclear war, violence, and peace. Across the world there are thousands of Dominican sisters, friars, priests, associates, youth and laity who all share in the Dominican Charism. As members of one Dominican Family, they work together to promote justice and peace as part of their fundamental Mission. 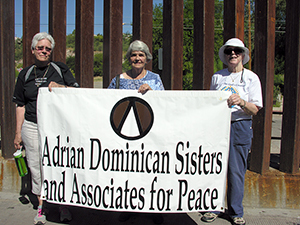 The Adrian Dominican Sisters are part of two international Dominican groups that lay the foundation and coordinate actions for the purpose of promoting social justice and human rights. The Jubilee International Congress on Dominicans - A group of 200 Dominicans from 50 countries, including four Adrian Dominican Sisters, recently met in Salamanca, Spain, where they committed themselves to promoting and defending human rights. Read their final statement and view the video on the Congress. 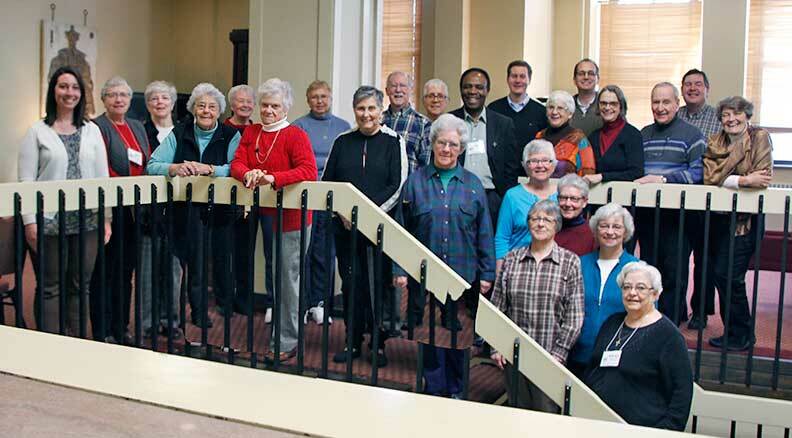 North American Justice Promoters - This group of representatives from Dominican Congregations in North America pledge to study, advocate and take action on specific issues relevant to justice, peace and care of creation. They provide resources and support for individuals designated as Justice, Peace and Care of Creation promoters within each congregation and lay organization. Read their Dominican Call to Justice Statement for 2015-2017. Intercommunity Peace and Justice Center (IPJC) acts for justice in the Church and in the world. IPJC is sponsored by 20 religious communities and collaborates with Catholic, ecumenical, interfaith, and other organizations in carrying out this mission. Leadership Conference of Women Religious (LCWR), the association of the leaders of congregations of Catholic women religious in the United States, serves as a resource to members and uses its corporate voice in solidarity with all who are suffering from violence or oppression. Partnership for Global Justice is an NGO Coalition of congregations, groups, and individuals grounded in gospel values who work in partnership by providing workshops and advocacy training to raise consciousness and awareness for the promotion of the UN Charter. Center of Concern is a faith-based, non-profit organization that works with international networks, prompting social analysis, theological reflection, policy analysis, political advocacy, research, and public education on issues of global development, peace and social justice. Eighth Day Center, a coalition founded by Catholic religious congregations, acts as a critical alternative voice to oppressive systems and works to change those systems. NETWORK, a national Catholic Social Justice lobby and a leader in the global movement for justice and peace, educates, organizes, and lobbies for economic and social transformation.